Korres Water Bamboo Freesia Eau de Toilette - 1.69 fl. oz. 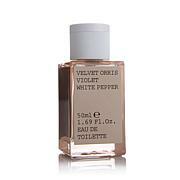 Korres Amber Violet Eau de Parfum 1.69 fl. oz. 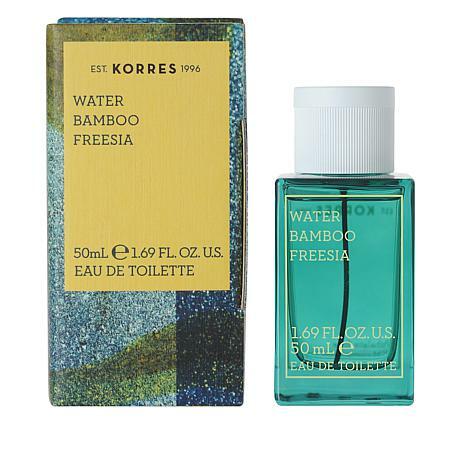 Korres Water Bamboo Freesia combines the scent of fresh bamboo and alluring freesia. The fragrance is inspired by the different shades of nature, from vegetal bamboo to a vaporous floral signature. KORRES WATER BAMBOO EDT 1.69 fl. oz. 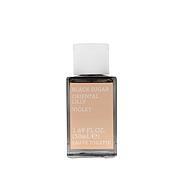 Ingredients: Alcohol Denat., Parfum/Fragrance, Aqua/Water/Eau, Brassica Campestris (Rapeseed) Seed Oil, Butylphenyl Methylpropional, Eugenol, Helianthus Annuus (Sunflower) Seed Oil, Hexyl Cinnamal, Hydroxycitronellal, Limonene, Linalool, Rosmarinus Officinalis (Rosemary) Leaf Extract. Please do not stop making this! It's so clean and fresh! BEST SUMMER SCENT! Amazing!!!!!!! I buy a lot on hsn and I some I keep and some I send back but this never!!!!!!! I really like the smell, a clean and refreshing smell:) wish it was a bigger bottle but it's still nice, best if used right of a shower. This is a delicious scent but only lasts 5 minutes,i wish it would last at least a few hours,needs something to fix the scent! I initially thought it was great but after it settled into my skin it smelled cheap and strong smell of a large alcohol content. Carol's Daughter Monoi Eau de Toilette 3.4 fl. oz.